Heat oven to 350°F. Spray 9-inch quiche dish or pie plate with cooking spray. 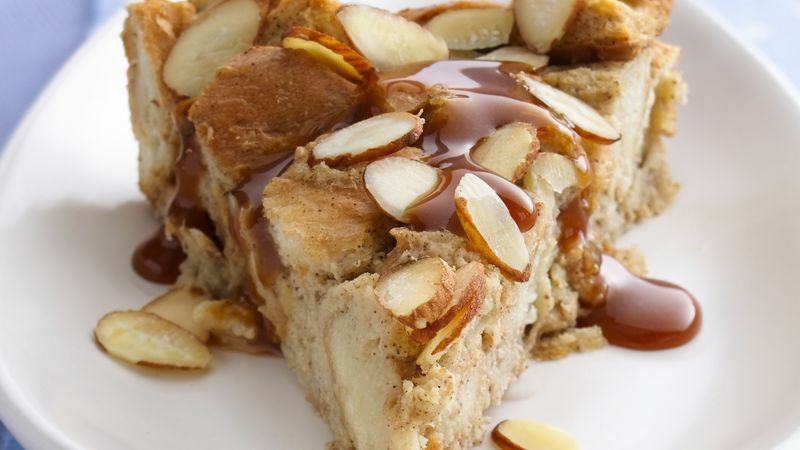 In large bowl, mix all ingredients except bread, almonds and caramel topping with wire whisk until smooth. Fold in bread. Pour into quiche dish; sprinkle with almonds. Bake 30 to 35 minutes or until golden brown and set. Cut into wedges. Drizzle caramel topping over each serving. Bread pudding made with a bread that's too soft can be very soft and almost mushy. Gently squeeze bread loaves to choose the one that has some resistance and doesn't feel like a marshmallow!